Christmas was an interesting day. We caught the 9 am bus to El Calafate and arrived at our Hotel ACA near 12:30 to 1pm. The weather was terrible…a constant drizzle. I felt very sorry for the folks we left behind in our hotel lobby in El Chaltén. They were waiting for their ride to Fitz Roy. They weren’t going to see a thing on their dreary hike. In El Calafate, we donned our rain gear and headed out for lunch. We tried to visit popular restaurant but it was closed. In fact, many places seemed to be closed until the evening. We did manage to get some pizza at a restaurant a few blocks from our hotel. Pizza is rather popular in Argentina, and this pizza was quite good. After lunch, we walked away from town toward the lake, Lago Argentino, the biggest freshwater lake in Argentina. We jumped over puddles and small streams on the sides of the streets until we reached a sidewalk the winds along the lake. Work out stations were positioned every hundred feet or so. After the short stroll, we returned to town. We walked farther down the main street, and we found it to be very touristy with several more restaurants open. I think every third store front was a chocolate shop. By 6 pm, it appeared the Christmas celebration for locals was over. The casino opened along with every shop. We walked to the far end of town for dinner. 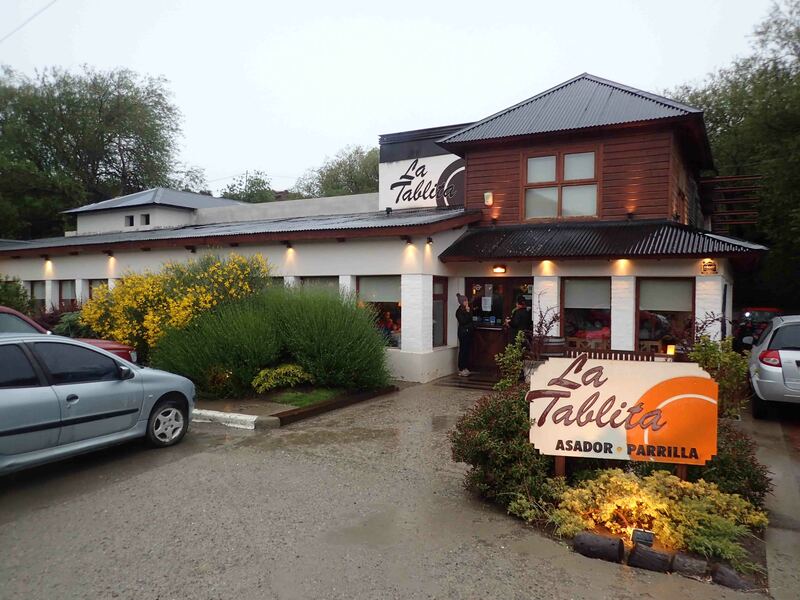 Fodor’s suggested that the locals go to La Tablita for special occasions, so we decided to try it for Christmas dinner. The lamb was fantastic, as were the desserts. Though pricey, we really enjoyed this dinner, and we got to use a credit card!